From League of Legends to Rocket League. It’s another busy weekend in the world of digital sports as lots of tournaments are gearing up for the summer finals. There’s plenty of action from the League of Legends LCS to the CS:GO ESL Pro League. We even have the Rocket League: Championship Series to look forward to. All the details on this weekend’s events can be found below. The NA LCS Summer season will be kicking off with a highly anticipated showdown between Cloud9 and Counter Logic Gaming. Cloud9 will be aiming to put their spring playoffs loss behind them after Team SoloMid took the trophy. However, TSM’s disappointing MSI performance showed clear weaknesses, but they hope to defend their dynasty with help of Yiliang “Doublelift” Peng in the bottom lane. Meanwhile, Team Liquid and Team Envy survived the promotion tournament, which marks the first time in the history of the NA LCS that the same group of teams will be competing two splits in a row. The full schedule and stream can be found by heading over to lolesports.com. It’s been a hectic midseason for G2 and the team has barely had time to rest since they took down Unicorns of Love in the EU LCS spring playoffs. G2’s MSI journey painted a picture of confidence, but it wasn’t enough to stop SKT from blowing open their Nexus in the final. However, the defending EU LCS champions will face ROCCAT in first game of the summer split. G2 did lose to ROCCAT at the end of the last regular split, but it wasn’t enough to stop G2 from claiming the title. 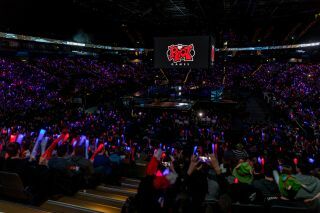 The full schedule and stream can be found by heading over to lolesports.com. Ten teams will battle it out in a deadly group stage that will kick off this year’s EPICENTER tournament. Only three teams from each group will advance to the playoff stage, so it expected to be a tense weekend for those participating. Group A will see OG and Team Liquid compete against each other along with the EU qualifier winner Team Secret. Na'Vi will also join the group, alongside the Chinese Regional Winners LGD Forever Young. Meanwhile, Group B has a diverse mix of regions where Evil Geniuses, Virtus.Pro and Invictus Gaming will be battling it out along with the NA Regional winners Thunderbirds and SEA Regional winners Clutch Gamers. The full schedule can be found over on epicenter.gg, while the stream is available on Twitch. This weekend the ZOTAC Cup Masters takes place in Taipei where four teams will battle it out for their chance to win the $100,000 prize pool. Danish Bears and Digital Chaos were eliminated from the tournament in the first round of playoffs, while Fnatic and iG Vitality will advance to face Newbee and NP. The semifinals concluded yesterday for US viewers, but those of you in Europe can catch all the action today at 03:50 CEST. Finals begin today at 17:50 PDT, while Europe can catch the action on Saturday at 02:50 CEST. The full schedule and stream can be found by heading over to zotac.com. The ESL Pro League is well underway and both G2 and North have taken control of groups A and B respectively. The quarterfinals saw mousesports take on SK, while Team EnVyUs battled it out with Team Liquid. Both North and G2 aim to land a decisive semifinals victory that will lead them to the ESL Pro League crown and the $750,000 prize pool. The semifinals begin today at 21:50 PDT / 06:50 CEST. All the action can be viewed by heading over to ESL’s official YouTube channel. The 2017 WCS Europe Qualifier will give four of the best StarCraft II players the chance to win travel, accommodation and entrance fully paid to 2017 WCS Valencia. Players have been battling through the gruelling open qualifiers and only the strongest have made it to double-elimination bracket. Matches begin today at 09:00 PDT / 18:00 CEST and continue the same time tomorrow. There’s certainly a lot on the line and anything could happen at this stage of the tournament. The matches can be watched over on Twitch. Overwatch Apex Season three continues to heat up as the group stages enter the final rounds. Today’s match will see two Korean giants clash as KD Panthera aim to settle the score with their rivals Lunatic-Hai. KD Panthera lost their opening match against Lunatic-Hai, but the team has not let this defeat impact their overall dominance in the arena. However, Lunatic-Hai has yet to lose a single match, so KD Panthera will need to be at their best if they’re to dismantle the current leaders. The Group A match begins today at 03:00 PDT / 12:00 CEST, while the Group B match between MVP.S and CB Spirit starts at 04:30 PDT / 13:30 CEST. Make sure to check out the full stream over on Twitch. Denial and Alpha Sydney are kicking off season three of the Rocket League world championship in Los Angeles today. The Canadian roster of CorruptedG, Lethamyr, and Sadjunior have been on top form and in week five they dispatched Rogue Esports to claim their regional championship spot. However, Alpha Sydney has dominated the Oceanic Region with their strong defensive plays and accurate cross-map goals. Drippay, Jake, and Torsos pose a threat to Denial’s claim to the RLCS throne, so they will need to remain focussed if they wish to advance. The full schedule and stream can be found by heading over to rlcs.gg.